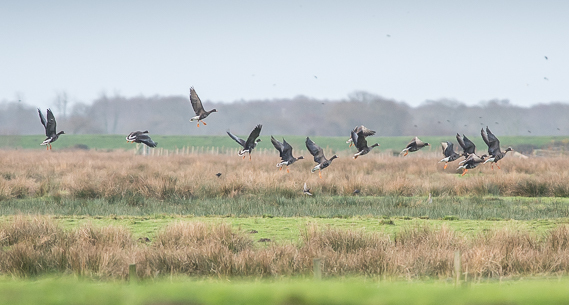 The elusive thirteen Greenland White-fronted Geese on the Dyfi estuary. When Tom Kistruck, the RSPB warden at Ynys-hir, told me that the most recent count of the Greenland White-fronted Geese on the Dyfi estuary, not far from the town of Machynlleth, had grown from the eleven that had been reported before Christmas to thirteen, I had a feeling that the number might prove to be as unlucky as I’d been the previous couple of days. I’m not generally a superstitious person but at times like this you sort of begin to wonder.